My short story how I got involved in this, and the nonsense of absolute any fund would be important. From my drive to change the system, I designed a product that should provide us with unlimited clean energy, and can be used for multiple purposes. I tried to find an investor, but I didn’t succeed, which I am not really dissatisfied with, because then I would have been restricted, and the product would be unaffordable for many. From my business plan that I had written, the expectations for Europe alone would have yielded more than €1,000,000,000,000 profit per percent market share per year. I realised that this was not/is not important to me because I do not want to live excessively myself, because I have a great dislike for people who abuse their wealth. This is how I came into indirect contact with Swissindo, where I received a commitment that the money for building the prototype would get if the funds became available. 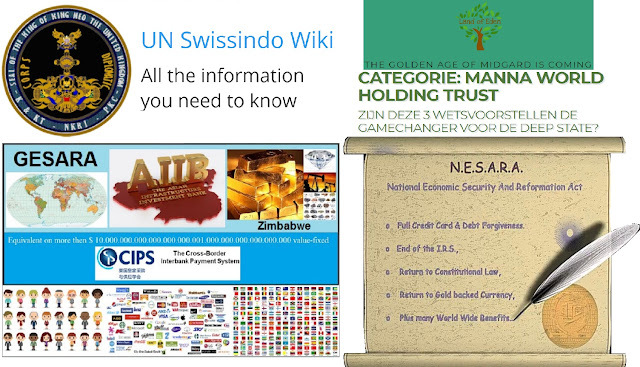 In 2012, the CABAL thought they could use Swissindo’s gold to help finance the NWO government. At all these banks accounts have been opened where the wealth of the gold of Indonesia is divided in money over 209 countries. This is for the Netherlands over 6 banks an amount of 6 times the national debt of America, so over € 120.000.000.000.000.000 for the Netherlands, where one can imagine which monies other countries will receive, when you consider that the assets that are going to be covered by Swissindo € 127.000.000 per earth inhabitant is on average reserved. The UN has tried here to impose a world government, by first destroying many countries with the help of Soros and the EU, they are all Deep State Puppets. Donald J Trump has put an end to this and has let the US incorporation go bankrupt, whereby the US federation has nothing to do with the debts of the US incorporation, and the US again exists sovereign 50 states. Since I had received the pledge for my funding from the Swissindo fund I had to wait, so to bridge this time I contacted other people and foundations. We started exchanging information in order to combine our solutions and where we can apply our inventions in order to be able to give a quick and positive interpretation as effectively as possible. That’s how I came up with people from the team who were already starting to grow on the idea of designing preventive health parks, where we combine talent to make this possible. This was in line with my idea to provide jobs, and income for people to lift them out of poverty, because the government deliberately pushes us into poverty and steals us from our labour fruits. Because the number of plans and solutions is growing, with a lot of jobs, but also solutions to restore the environment, the plans have also increased. That is why I came up with the idea, to www.freelife.world to use this as a project portal to submit their plans and thus contribute to more jobs and a better environment. My contact with Swissindo suggested that I could fund my own network, as it was growing very fast. For example, I symbolically received a ZIM note, in case the RV was faster when Swissindo’s funds were released. I have the assumption that these will all be brought into the new BRICS, QFS system where the Swissindo fund seems to be the smallest fund. 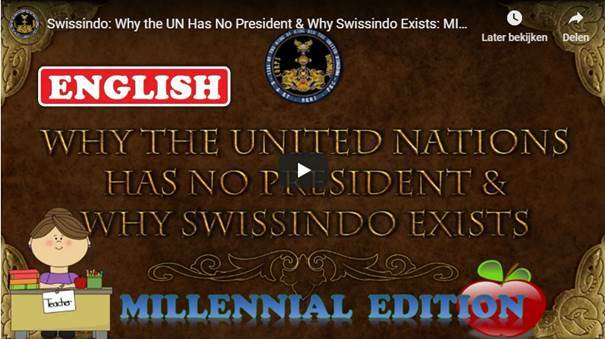 The World Bank has been financed by Swissindo since 2012 to give them the opportunity to implement the transition to a new money system, which they clearly did not do to not want to relinquish the Deep State power themselves. The Alliance that wants to destroy the Deep State had chosen Donald J Trump for his independence, and his mentality as a go-getter who had the intellectual capacity and has the ability to implement the plan. Everybody’s desire, in combination with waiting and different insights, make that division arises, and people think in their absolute right, which results unnecessarily in collaborations being put under pressure, which is totally unnecessary for my experience. We should not want to dominate, dictate but facilitate each other to make a respectful cooperation possible, someone who does not get the money to do so should do nothing instead of stir up mutual dissatisfaction. Which fund will be released first, the rest will follow and not be left behind, because the funds only support the QFS, which means that it doesn’t matter if you have put your bet on the ZIM, Manna Trust, Swissindo or any other fund. Our strength should be in connecting and sharing with each other, if we have objectives that are contradictory to our individual actions we don’t set a good example. I have said that governments also have large sums of money to use to make the transition run smoothly, but they have a double agenda, and they do not want to lose power over the population if this population becomes income independent of government. What governments do not fully realise is that they no longer have a monopoly on the money supply and are as vulnerable and dependent as the population has been before. They also do not seem to realize that people who will now also receive funds, in the absence of a fair distribution of the government, will take over this role, and in doing so will claim the funds from the government. A government without money is a lame duck that can’t do anything anymore. Regardless of whether a hard or soft Brexit, the EU is dead, because they will not get any funds from the former Bilderberg governments. Even if all the countries of Europe introduce their own currency again, the corrupt EU will be over. If everyone receives a basic income in their own country of birth from themselves or their parents’ country of birth, the deliberate cultural mixing will decrease and the Kalergi plan will stop to secure peace. Those who do not want to leave may be motivated by withholding and basic income to go back if they cannot adapt to the culture and customs of their host country. In order to bring the amount of money into society in a responsible way, it is not the intention that everyone will get millions into their bank account. This would be a chaos because nobody would want to work anymore and we would no longer produce food for each other. Money is the means, not the end as it has been so far. Shares of companies is complete nonsense and does not contribute to prosperity, but stimulates greed, stock exchanges work for the rich, because they do not have to pay anything to trade shares, they cheat because their computer purchases and sells them. As a result, small investors are systematically robbed in the Wall Street fraud casino, the average time that shares are held by a person or institution is 22 Seconds, which indicates that nothing is right. Bitcoin bought with FIAT money is therefore only a speculation object without value covered guarantee, people are fooling themselves. Block change technique against it, has the advantage of banking secrecy, no more central banks, no more money laundering of criminally obtained money, by being able to track all transactions. Then it is no wonder that Governments are not so happy with the new QFS supported money system that prevents them from carrying out further criminal acts themselves. All governmental activities of environmental crimes will stop here, including Chemtrails, HAARP, CERN, WHO, stealing water rights from local in national populations. It is our moral duty to enforce this in a very short time so that the changes are also perceptible, and give people hope for a healthy and happy life. People who are committed to these ideals are the saviours of the earth and humanity. False propaganda by the Deep State governments stop automatically when the MSM has no money left or sees its accounts expropriated by false propaganda imposed by Bilderberg governments by the CABAL.